Don’t be put off by its hard to pronounce name, quinoa is super easy to cook, just treat it like rice – you can even cook it in your rice cooker. First give it a good rinse in cold water – this step removes any remaining bitterness on the quinoa, caused by naturally occurring sapponins, and will ensure your quinoa is fluffy. In a pot add 1 cup of quinoa and 2 cups of water – this makes about 3 cups of cooked quinoa. Bring to the boil, cover and simmer for about 10 minutes. The quinoa is ready when all the water has been absorbed and the grains are open and tender. Fluff with a fork and enjoy! Quinoa is a versatile little superfood and with thousands of recipes available on the internet, it can be hard deciding what to try first! Here are links to some of our favourite recipes – let’s be honest, we are not that flash in the kitchen so we will leave it to the experts! 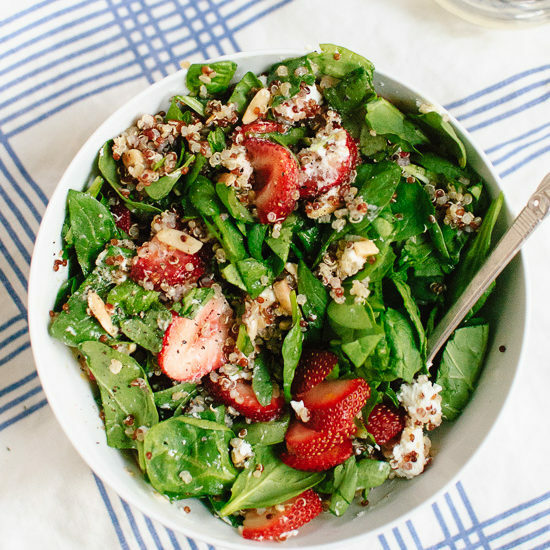 A refreshing strawberry, spinach and quinoa salad featuring a zippy lemon dressing, savoury toasted almonds and creamy, tangy goat’s cheese. It’s the kind of summery, dinner-sized salad that will fill you up without weighing you down. 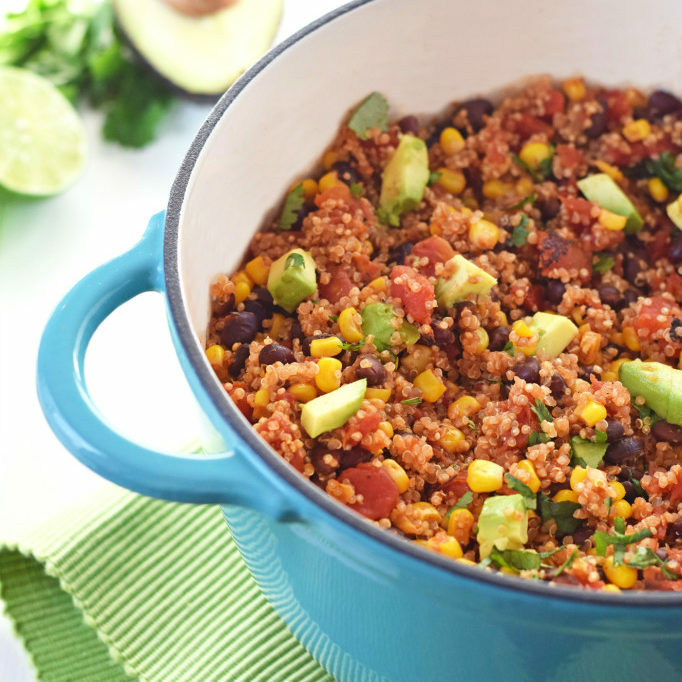 Packed with protein and vegetables, it only takes 20 minutes to have this healthy, gluten free One Pot Mexican Quinoa on the table. It’s a nutritional powerhouse meal that the whole family will love! 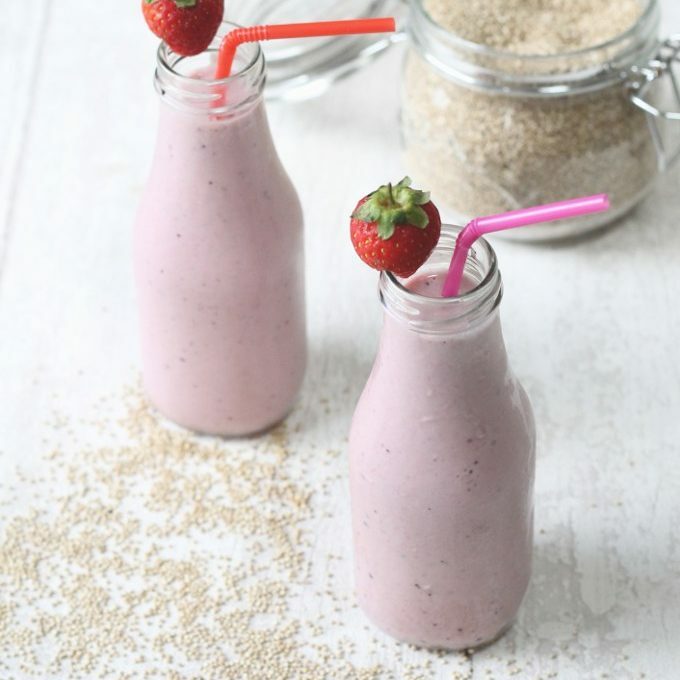 A protein packed smoothie made with quinoa, greek yoghurt and berries. A delicious and healthy snack, it uses banana and frozen berries but you can of course experiment with the flavours and add different fruits. 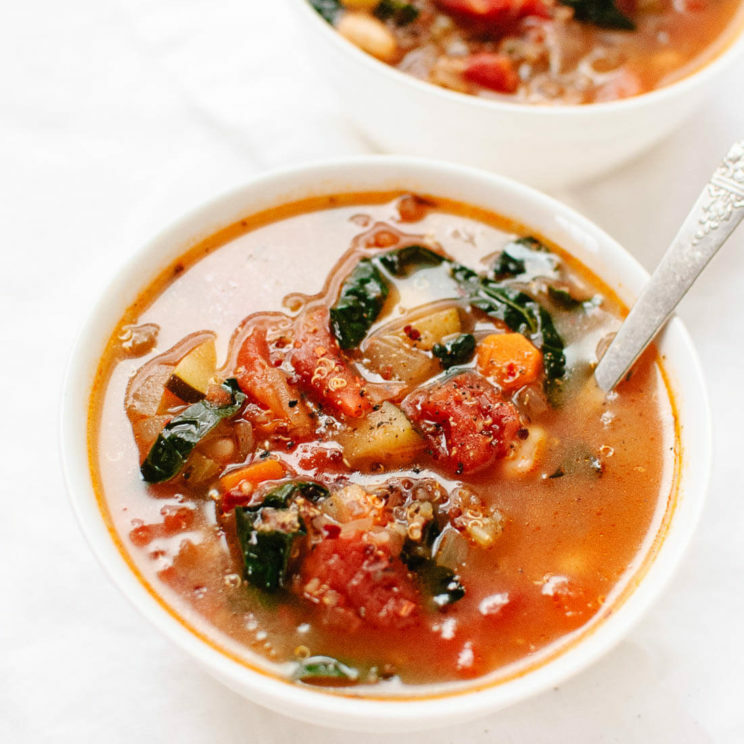 This healthy homemade vegetable soup recipe is full of veggies, kale and quinoa. It’s easy to make and good for you, too! This soup makes great leftovers. It’s gluten free and vegan as long as you don’t top it with optional Parmesan cheese. 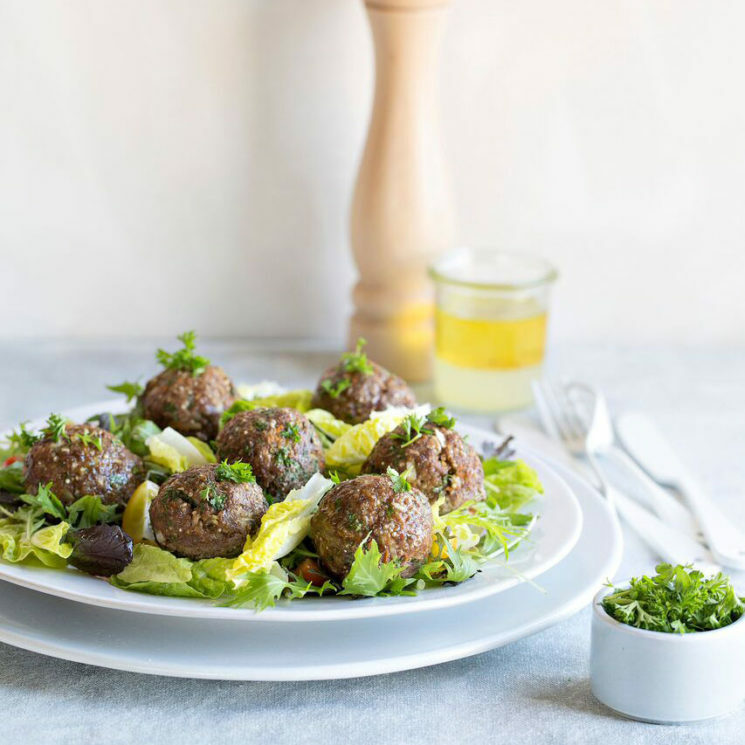 These spicy beef and quinoa balls are full of vegetables plus fibre from the quinoa, so can be eaten alone, or you can add a salad for extra nutritional value. In winter you can pair the meatballs with a warmed home made tomato sauce and spaghetti. 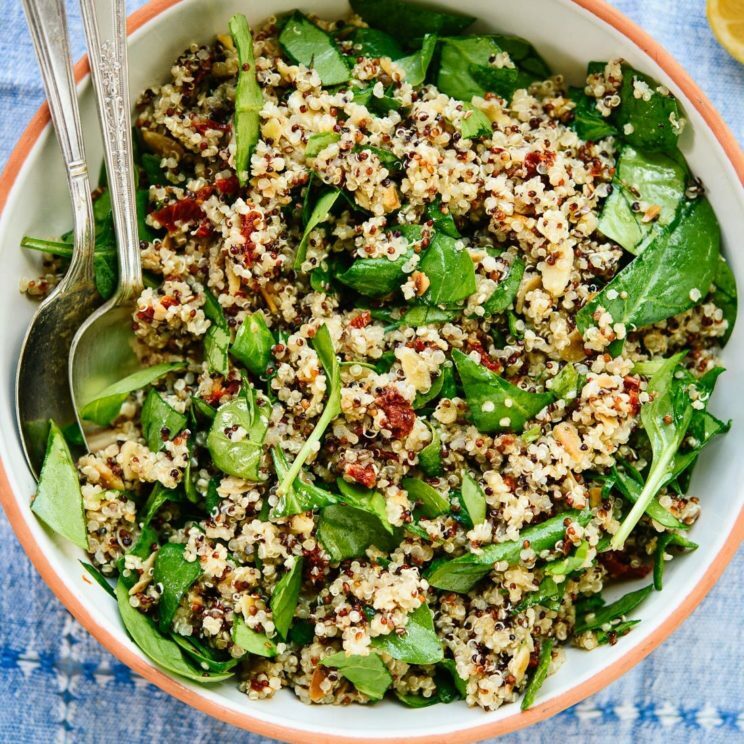 This simple spinach quinoa salad is full of fresh Mediterranean flavors, including lemon, sun-dried tomatoes and toasted almonds! It’s vegan and gluten free, too, so it’s a great pot luck option. 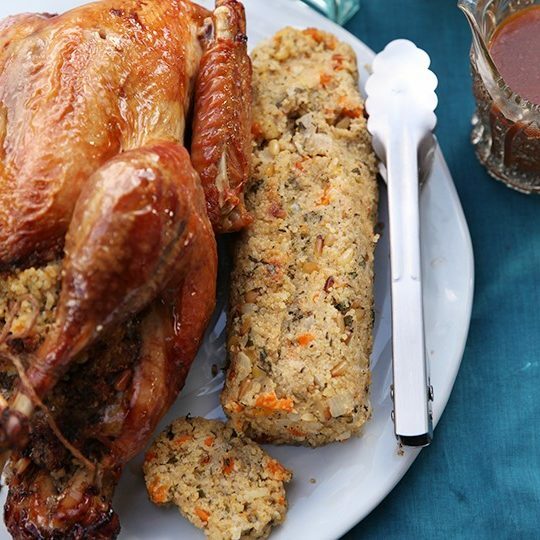 This gluten-free stuffing has a nutty flavour and makes a nice change from breadcrumbs. This recipe makes enough for a turkey, so for a chicken you’ll only need half as much. If you’ve got vegetarian guests, cook the stuffing separately from the turkey so they can have some too. Quinoa is great for breakfast. It’s firm texture is perfect in this creamy porridge. The lemon and blueberries add a burst of freshness and make this recipe the perfect way to start the day. This cake will wow both family and friends who are accustomed to eating traditional sweets. Even knowing that the cake was made from quinoa, you can’t detect an odd taste or texture. 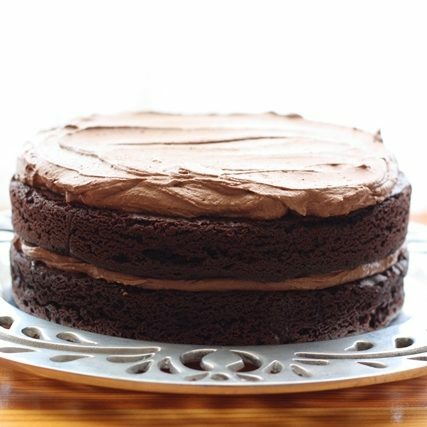 This is a very dangerous chocolate cake. 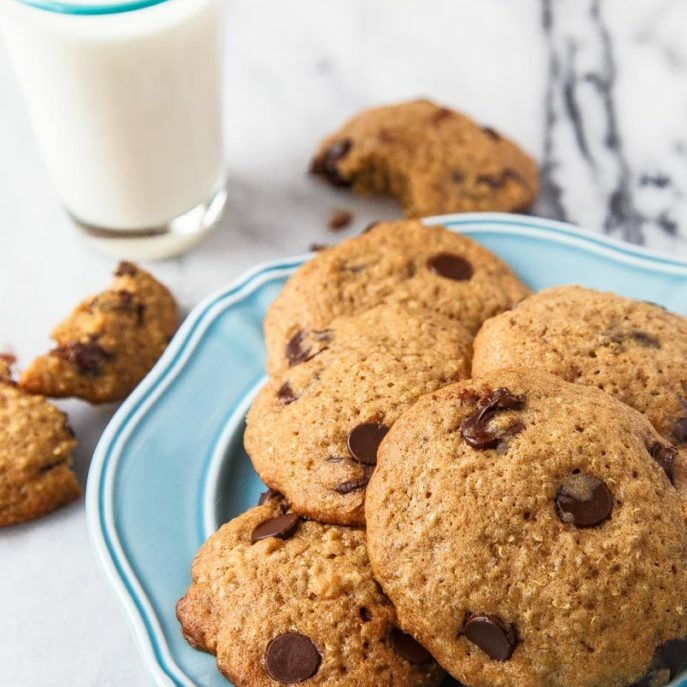 The quinoa makes the cookies thick and soft, but the melted butter keeps them crisp around the edges, like a good chocolate chip cookie should be. Who knew that stirring in a superfood would make a cookie both chewy and crisp? It’s basically perfection in a cookie with a high protein, super food status. Shredded broccoli florets form the foundation for this slaw, which you can easily make yourself in a food processor. Cooked quinoa blends right in, thanks to its similar texture and complementary flavor. 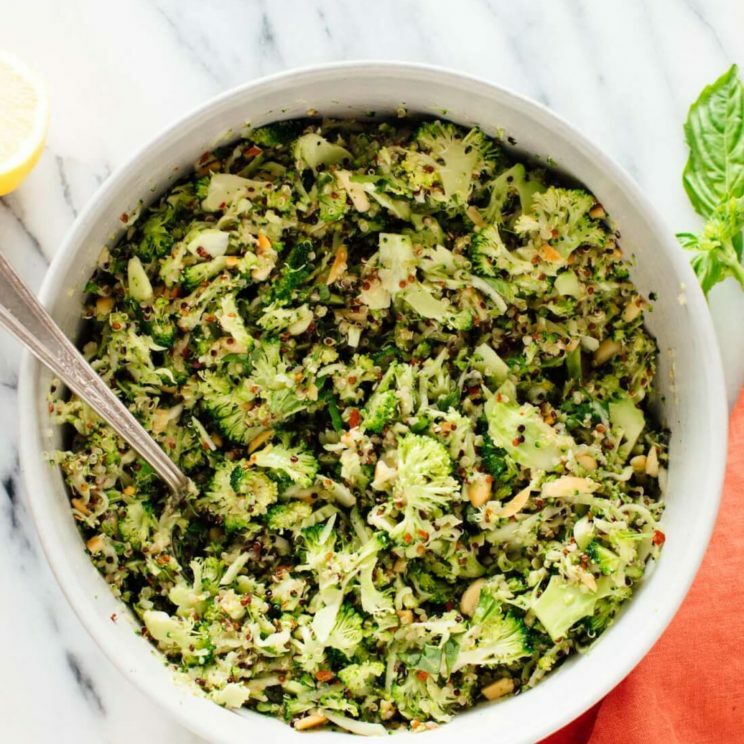 Add toasty almonds, a tangy honey-mustard dressing and chopped basil for little bursts of freshness flavor, and you have one fantastic mayo-free broccoli slaw. 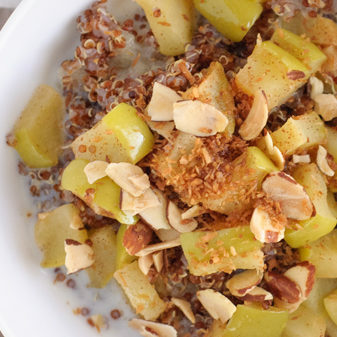 Breakfast quinoa is just as filling as oatmeal and as easy to make, with endless variations. 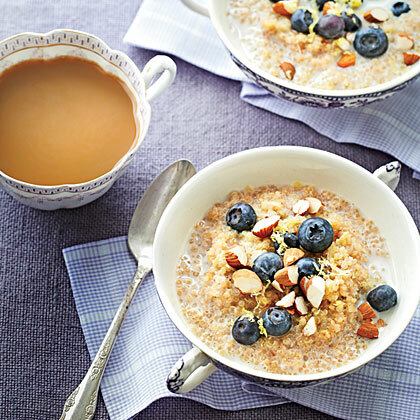 Quinoa has a nutty flavor that goes well with breakfast toppings, plus it’s a highly nutritious way to start the day. Breakfast quinoa is a perfect way to use up leftover quinoa, and you can easily make it a vegan meal if you use almond, coconut or soy milk instead of regular milk.